On August 24th, all of us except Ringo attended the lecture given by Maharishi at the Hilton Hotel. I got the tickets. I was actually after a mantra. I had got to the point where thought I would like to meditate; I'd read about it and I knew I needed a mantra - a password to get through into the other world. And, as we always seemed to do everything together, John and Paul came with me. PAUL MCCARTNEY: It was George's idea to go. During Sgt Pepper, George was the most interested in Indian culture. We were all interested in it - but for George it was a direction. But it was nice to hear Ravi Shankar's music, it was interesting and very beautiful - and it was deep, technically deep. I remember Peregrine Worsthorne being there, and I read his article the next day to see what he thought. He was a little bit sceptical. But we were looking for something; we'd been into drugs, and the next step was to try to find a meaning for it all. We'd seen Maharishi up North when we were kids. He was on the telly every few years on Granada's People and Places programme, the local current-affairs show. Wed all say, 'Hey, did you see that crazy guy last night?' So we knew all I about him: he was the giggly little guy going round the globe seven times to heal the world (and this was his third spin). GEORGE HARRISON: I thought he made a lot of sense; I think we all did. He said that with a simple system of meditation - twenty minutes in the morning, twenty minutes in the evening - you could improve your quality of life and find some sort of meaning in doing so. JOHN LENNON: We thought, 'What a nice man,’ and we were looking for that. I mean, everyone's looking for it, but we were all looking for it that day. We met him and saw a good thing and went along with it. Nice trip, thank you very much. The youth of today are really looking for some answers — for proper answers the established church can't give them, their parents can't give them, material things can't give them. JOHN LENNON: Cyn and I were thinking of going to Libya, until this came up. Libya or Bangor? Well, there was no choice, was there? 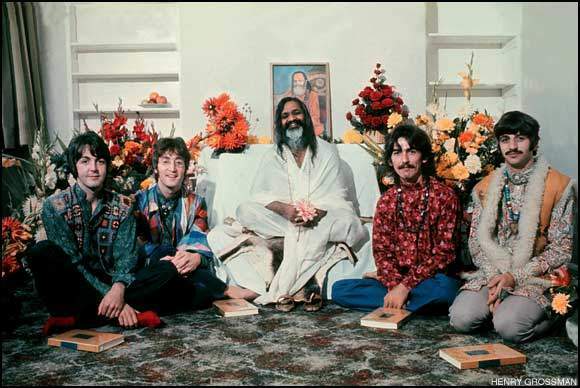 GEORGE HARRISON: Maharishi happened to be having a seminar in Bangor and had said, 'Come tomorrow and I'll show you how to meditate.' So, the next day we jumped on a train and went. Mick Jagger was also there. He was always lurking around in the background, trying to find out what was happening. Mick never wanted to miss out on what the Fabs were doing.